From the dangerous world of the Demon Cycle comes the early adventures of Arlen, Peter V. Brett’s quintessential fantasy hero. These exciting origin tales follow Arlen as he learns to navigate a world where the elemental forces of evil conjure themselves from the earth each night. Humanity has barely survived a demonic onslaught by using magical wards that protect their cities and homes. Only a handful of mercenaries and explorers risk traveling after the sun sets. Arlen, seeking adventure and fortune, is barely protected by the warded armor upon which he has inscribed intricate defensive runes. From a journey ferrying a wagonload of dynamite to a mountain stronghold, to a dangerous mission to recover desert treasures, Arlen faces friends and enemies with a strong arm and a cunning wit. I won’t give any more synopsis before the break, as I don’t want to offer any spoilers for new readers. So, if you haven’t read The Painted Man(The Warded Man in the US), then I recommend you go an do that immediately, before diving into these. In this eBook, we get a pair of short stories focussing on one of the main characters from The Painted Man, Arlen Bales. Both of the stories have been released previously as limited editions by Subterranean Press, and are so rare that they’re now selling for $400 in some places! Thankfully, the eBook is way more affordable, so I snapped it (and The Desert Spear) up for my Kindle as soon as I finished The Painted Man. A superb, short foray back into the world, I really enjoyed reading about Arlen and his early adventures again. These two stories are perfect for fans who need a fix before the next book’s release. But there was a time when the demons were not so bold. A time when wards did more than hold the demons at bay. They allowed man to fight back, and to win. Messenger Arlen Bales will search anywhere, dare anything, to return this magic to the world. Abban, a merchant in the Great Bazaar of Krasia, purports to sell everything a man’s heart could desire, including, perhaps, the key to Arlen’s quest. 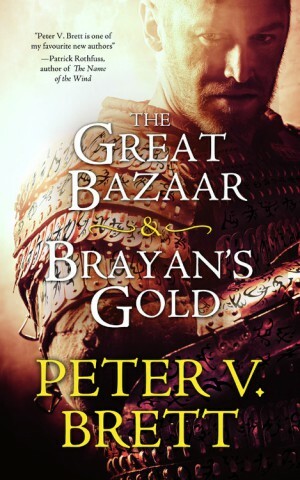 In the first of these two stories, Arlen is on an quest out in the desert, searching for rare artefacts to trade in the Great Bazaar of Krasia. Feeling particularly impetuous one night, he leaves the safety of his portable ward circle, and ventures out into an abandoned settlement, only to come face-to-face with a rare breed of demon, and barely survive the night. His combination of determination, skill, and pure blind luck is great fun to read about, and Brett manages to make the night scenes tense and exciting. Through Arlen’s interactions with the people of Krasia, we learn some more about the desert society, and the all-powerful position of the “dama”, their religious leaders, and just how poorly they treat the people of lower castes. 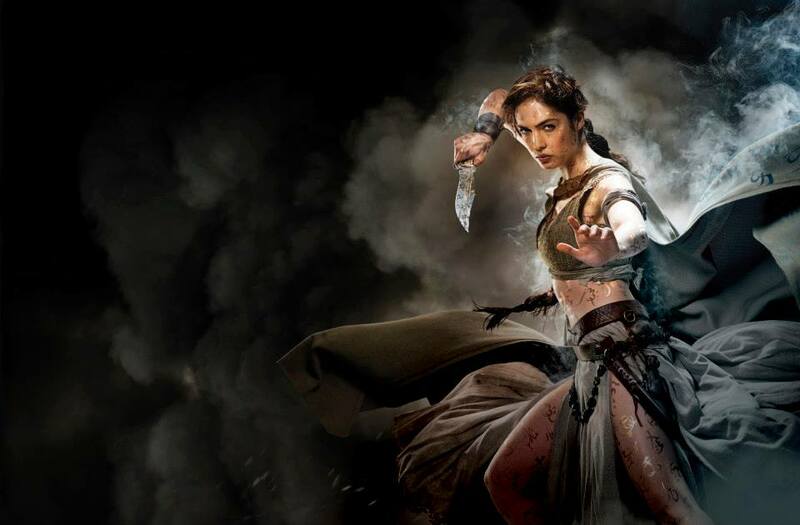 It’s an interesting culture to read about – like a mixture of Middle Eastern and Indian, complete with strictly enforced cultural strata and a proud, grim martial tradition. Naturally, and as in The Painted Man, Arlen struggles to accept some of the more strict and illiberal social mores – this gets him into trouble with the authorities as well as winning him respect from some of the people. 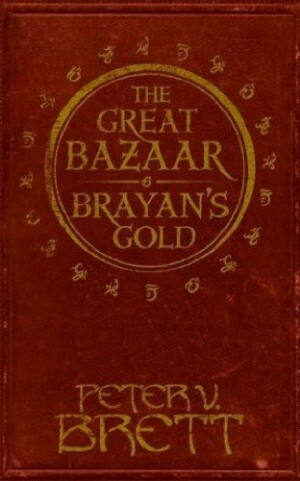 The Great Bazaar adds a little more colour to the characters we met in The Painted Man, and fills in some details of times when the narrative of the first novel jumps ahead in time. I was really happy to learn more of Arlen’s time in Krasia, which proved to be such an important and formative experience for him on his journey to become the Painted Man. Arlen Bales is seventeen, an apprentice Messenger in brand new armour, about to go out for the first time alongside a trained Messenger on a simple overnight trip. Instead Arlen finds himself alone on a frozen mountainside, carrying a dangerous cargo to Count Brayan’s gold mine, one of the furthest points in the duchy. And One Arm, the giant rock demon, hunts him still. But Brayan’s Gold may offer a way for Arlen to be free of One Arm forever, if he is willing to wager his life on the chance. This story is set earlier than The Great Bazaar, when Arlen’s still learning to be a Messenger. It’s about his first big assignment, to a mine high in the mountains. Things really don’t go according to plan. He meets some interesting people along the way, experiences more of this world’s stratified society, and sees the difficulties its people face in another region. It would be nice if we could visit this location again – either in a future novel or another short story. It’s another good story that fills in more detail of Arlen’s formative time learning the Messenger trade, and also fleshes out our impression of the world. Most importantly, it illustrates his single-minded pursuit of anything and any way to take the fight to the demons, not to mention his survival skills. The whole story, I found, was a perfect explanation of who Arlen is and what drives him. Another great thing about this story is the fact that visiting different terrain and a new environment means Arlen will be faced with different challenges and dangers, forcing him to think on his feet. It leads to some ingenious out-of-the-box thinking on his part, not to mention some experimentation on how to deal with One-Arm. He also makes some interesting discoveries about how to combat a couple of different types of demon (in this and The Great Bazaar). In both of these short stories, Brett’s skill as a writer shines through. His prose has that superb quality that pulls you right on through the story, whizzing through the pages at an alarming rate. Really engaging, it’s no wonder this series is so popular, and continues to do so well. To repeat what I said before the break above, I’d only recommend this pair of short stories to those who have already read The Painted Man – otherwise some of the events of said novel will be spoiled. This was a great, short read. Really very highly recommended, this is a must-read for all fans of the series.